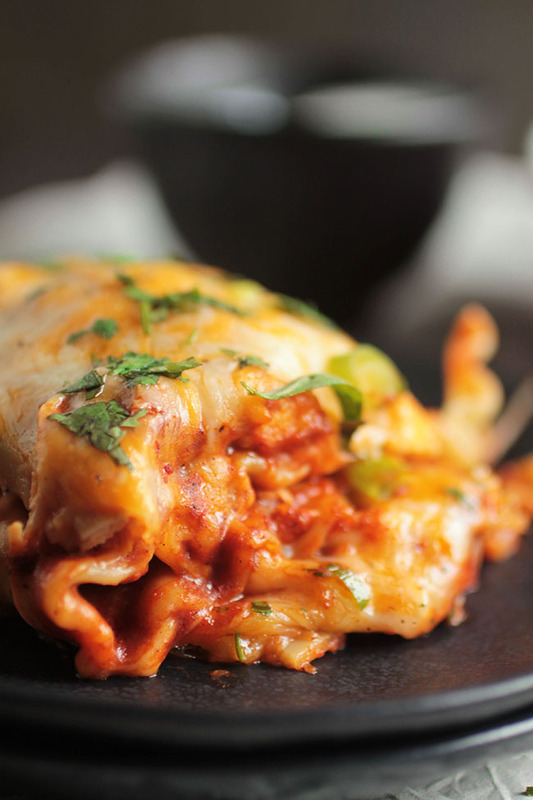 This easy enchilada lasagna recipe is a fun twist on your favorite lasagna! 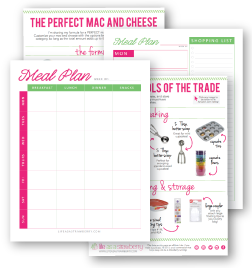 An easy chicken recipe for busy weeknights – and it freezes wonderfully if you want to make it ahead of time for freezer meals! Happy Monday! 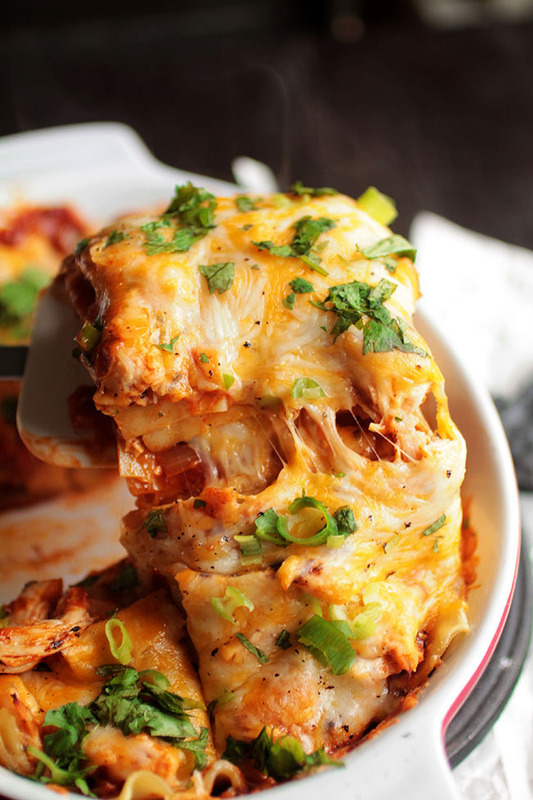 Have a lasagna. Remember my new favorite enchilada sauce? I still can’t stop eating it. I also can’t stop eating this slow cooker salsa chicken, so this recipe has BOTH of those things. Also (BONUS!) there are noodles and an obsceeeeene amount of cheese, because Monday. And normally, that would be my reaction, too. But believe me when I tell you that this lasagna (especially when you make the sauce from scratch and use that salsa chicken we talked about) is worth the face melting. So worth it, in fact, that I made it twice last week. This recipe also freezes well, and you could totally add vegetables (think corn, black beans, zucchini, tomatoes) if you’re into that kinda thing. Top it all off with a dollop of plain Greek yogurt or sour cream and fresh cilantro, and throw on some sliced green onions for a bit of texture and flavor. 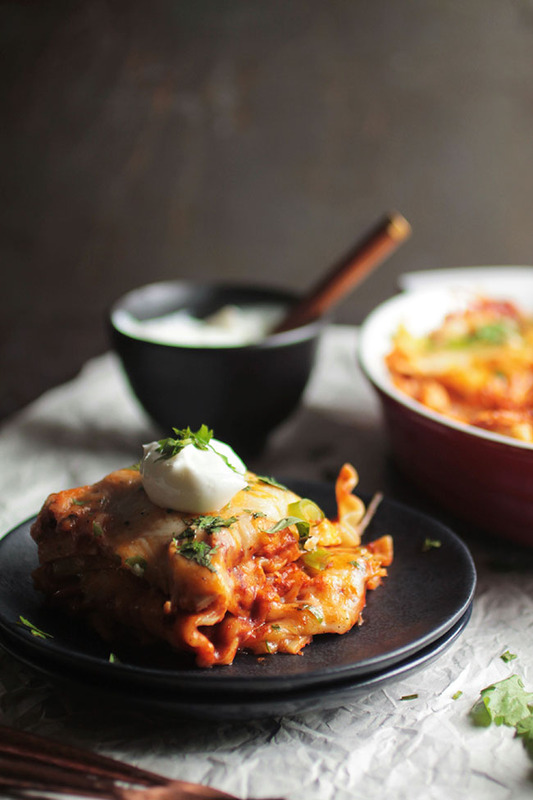 Don’t forget to let this enchilada lasagna cool for 10-15 minutes after it comes out of the oven – it’ll be easier to cut and lift slices out of the dish without your nice lasagna stack falling apart on you. 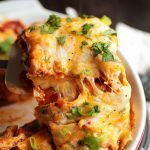 I’m also a big fan of how fast this lasagna comes together even with the homemade components – just pop the salsa chicken in the slow cooker in the morning, make the enchilada sauce while you wait for the noodles to cook, layer it all together and boom! Lasagna. 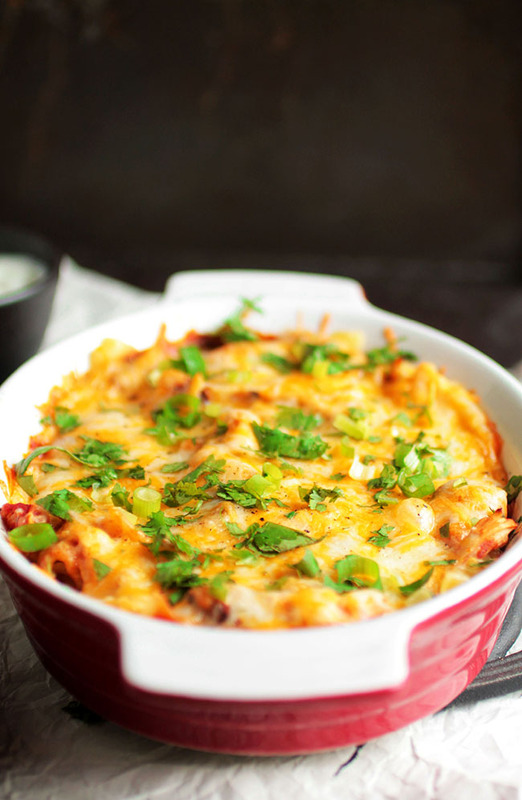 An easy lasagna chicken enchilada bake with homemade enchilada sauce. Cook lasagna noodles in very salty water until they’re a few minutes less than al dente. Noodles should bend easily but still have a noticeable crunch when you bite into them. Spread a bit of enchilada sauce on the bottom of a baking dish (use a 9×13 for one lasagna or divvy it up between a few smaller dishes for smaller portions) to prevent noodles from sticking. Lay down a layer of noodles, then a layer of enchilada sauce, then a layer of shredded chicken, then a layer of cheese, and repeat until dish is full or you run out of noodles. 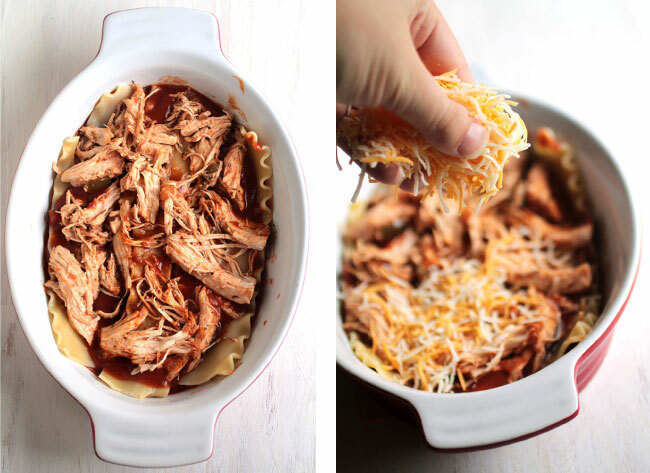 End with a final layer of noodles topped with enchilada sauce and a generous handful of shredded cheese. At this point, you can bake the lasagna or store it in the fridge or freezer for later. If you’re storing it for later, let it cool on the counter then wrap tightly with plastic wrap. If you’re ready to eat immediately, bake lasagna at 375 degrees F for 15-20 minutes until the cheese is melted and bubbly. (If you’re baking a cold or frozen lasagna, allow an extra 20-30 minutes cooking time to make sure lasagna is heated through). Let cooked lasagna cool on the counter for 10-15 minutes before slicing. Top with cilantro, green onions, and a dollop of plain Greek yogurt and serve. Corn, zucchini, bell peppers, and black beans are all great additions to this lasagna. Ground turkey or ground beef (or extra veggies!) are good substitutes for the shredded chicken. Yes yes yes!! You are my hero. I am definitely adding this to my post baby freeze project. I just love the layers! !